Babar came to Turkey recently with his friend. They were mostly in other cities, but they had a chance to visit Ankara (the capital city, also where I live in) yesterday. I brought them to the city center, places where Turkish food are served best, and a random cafe where they could drink Turkish coffee. I was planning to show them a street which is more like European and drink the coffee there, but we had to take their train tickets and it was too adventurous, so I took them to a cafe close to the place where we bought the tickets. It was such a fun day. I hope I can meet other AGS'ers in the future, too. I always wondered if it was the comedian from Bad Boys. 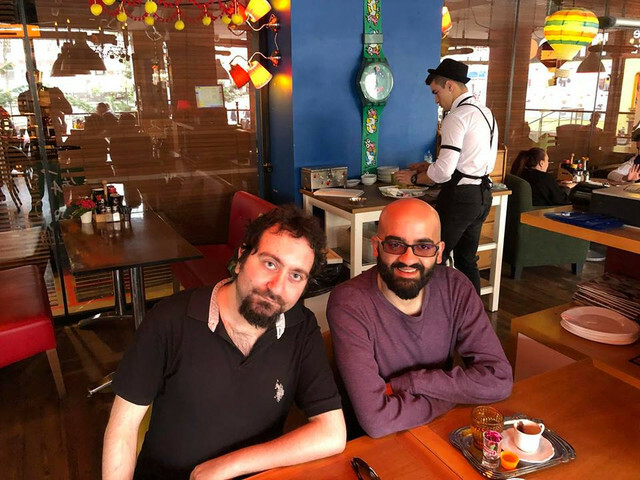 Yes, it was the great Ahmet/Ahmed meet-up! Gord10 gave me a grand tour of the city interspersed with what was essentially a train-ticket scavenger hunt. And yes, having never attended a mittens, it's fun to have still met so many AGSers! Always cool to see AGSers meeting up. 2. It instantly changes how your brain "hears" their forum posts.